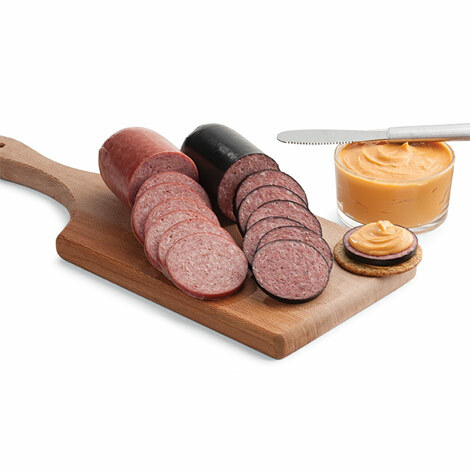 Double-Smoked Summer Sausage is teamed up with smooth Cheddar Cheese Spread and Light-Smoked Summer Sausage to add some zip to your snack time. Add some crackers and enjoy! Great product! Arrived quickly in nice packaging. Tasted wonderful! Great products - opportunity for new gift notifications? Your products are amazing and always appreciated by the people on my gift list. One suggestion - for recipients you request a phone number and email for delivery. I assumed that both were in case there were issues with people being out of town, etc. When I checked out, I checked the box for "send receipt" thinking it would send an email for the recipient to expect a package - which would be a nice alert to send. I did not expect the entire invoice of the products AND the price to be sent to the recipient. More clarity on these options would be nice to avoid "leaving the price tag" on the gift while still trying to maximize awareness of the recipient to be on the lookout for packages so they can have neighbors help keep watch if needed before packs of wild dogs or coyotes run off with the packages or the package sits unattended for too long in weather not conducive for product storage. Thanks for your consideration. Amana Response: Hi Bradley, Thank you for your comments and all your orders. We appreciate your business very much! We don't send a receipt with any sort of pricing to recipients, so not sure what your recipient received. What is sent if you include their email is a short email announcing that a gift has been ordered for them and when they should expect it. And they also receive a UPS tracking email when it is shipped. Sorry if there was some confusion - I agree that an alert that they have a gift coming is always a great idea. Thanks again! I ordered this combo for my hubby who is a huge Thuringer fan. The summer sausage and the cheese was a big hit. My only wish is that I could just the thuringer. Great company to deal with. I will be a returning customer. The items I ordered were shipped out Tuesday and arrived at my home on Thursday. The pork tenderloins were frozen and the sausages were ice cold. I had contacted customer service with a question as to when the product were to be shipped and what she e-mailed me the next day was spot on. I even got a product I did not know I was going to get. The taste test will follow. We were thrilled with all our items - summer sausages, ham, Swiss cheese, mustard, horseradish, and cheese curds - except the calico cheese. It was incredibly dry. Could not slice or cube it. Ended up with pile of crumbly mess. Could not use on my holiday cheese tray. The rest, however, was incredible. Amana Response: Thanks so much for letting us know about the calico cheese. We are so sorry that happened and hope your replacement cheese was much better! So glad you enjoy our Amana products! The order was delivered so quickly! And everyone loves the meat and cheese. We have never been disappointed with Amana meats! I have been sending my Mother and relatives in the Southern US Amana products for years. They are always pleased with the quality. I have been delighted with the service that Amana staff have provided over the years. A great company. Amana Response: Thank you so much! We appreciate your business and always enjoy sending gifts for you! The order was perfect and prompt over the holiday season. Great product and a good value for a Christmas gift to distant loved ones! Amana Response: Hi Mary, We are so sorry that happened to the cheese spread! We will send you a replacement right away. Thanks for letting us know. Over the years, one of our favorites! Excellent size for gifting...the kids were thrilled & loved everything. No cooking required. Just slice and serve with your favorite crackers, or make a delicious sandwich. Refrigerate after opening. Tip: Pairs well with our German Mustard. Delicious!